The government imposed a state of emergency in the island after Buddhist mobs attacked mosques and businesses belonging to minority Muslims in the central highlands district incensed over an altercation over the weekend. 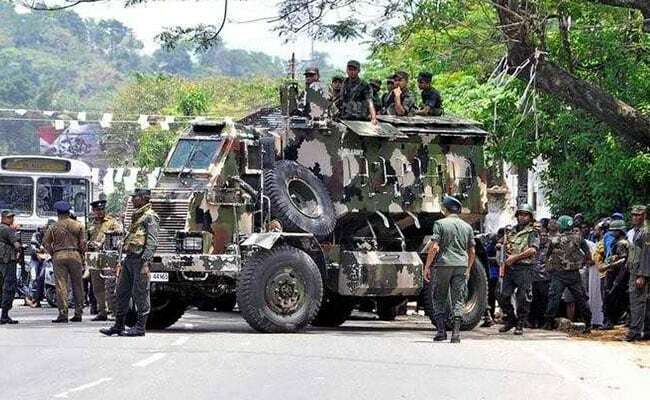 Sri Lanka's army soldiers stand guard after clashes in Digana, Sri Lanka. Colombo: Sri Lanka shut down social messaging networks including Facebook on Wednesday to control violence targeted at the country's minority Muslims, officials said, even after the imposition of emergency in the Buddhist-majority island. Tension has been growing between the two communities in Sri Lanka over the past year, with some hardline Buddhist groups accusing Muslims of forcing people to convert to Islam and vandalising Buddhist archaeological sites. Some Buddhist nationalists have also protested against the presence in Sri Lanka of Muslim Rohingya asylum seekers from mostly Buddhist Myanmar, where Buddhist nationalism has also been on the rise. Police clamped an indefinite curfew in the central highlands district of Kandy where the violence has been centred since Sunday following the death of a Buddhist youth in an altercation with a group of Muslims. Buddhist mobs attacked mosques and businesses belonging to Muslims overnight, residents told Reuters on Wednesday, even after President Maithripala Sirisena imposed emergency for seven days to control the violence. Police spokesman Ruwan Gunasekara said there had been "several incidents" throughout Tuesday night in the Kandy area, famous for its tea plantations. "The police arrested seven people. Three police officers were injured from the incidents," Gunasekara told Reuters. There was no information about how many civilians had been wounded, he said. Some of the violence has been instigated over social media with postings appearing on Facebook threatening more attacks against Muslims, the government said. On Wednesday, it said Facebook, Viber and Whatsapp would be blocked across the country for three days. Sri Lanka is still healing from a 26-year civil war against Tamil separatists that ended in 2009, with reports of rights abuses on both sides. Muslims make up 9 percent of the 21 million population, the smallest minority after ethnic Tamils, most of whom are Hindus. UN rights chief Zeid Ra'ad al-Hussein said he was alarmed by the recurring episodes of violence against ethnic and religious minorities in Sri Lanka and sought accountability. "There should be no impunity, either for the incitement that led to the attacks, or the attacks themselves," he said in a speech to the UN Human Rights Council in Geneva. The US State Department in a security alert warned of the possibility of further unrest in Kandy, famous for a temple said to contain the tooth of Buddha. A government minister said the violence in Kandy had been whipped up by people from outside the area. "There is an organised conspiracy behind these incidents," Sarath Amunugama, a senior minister, told reporters in Colombo.